What is this fish trying to do? I usually ask myself that after going over my games with Rybka. I have no clue what is going on with half of the moves it suggests. Especially in one of my recent games against Ian where I played a hedgehog type formation against his 1.c4. I, playing black, had no weaknesses. Ian had a huge space advantage and because of that, the computer gave him a favorable edge. How to win with that is another story. The computer made some senseless suggestions with plenty of bizarre maneuvering for both sides. In the end, I learned nothing. GM Miguel Illescas, during game 4 of the World Chess Championship match, commentates on ICC about this. Here is a snippet of what he and co-host Macauley have to say about the following position where Anand just played Ne3-g4! GM Illescas: Propbably one of the best options from a practical point of view. Macauley: Ironically, after building quite a significant plus score according to Deep Junior 2010...it dropped a bit, just barely above 0.00 after Ng4. The computer seemed to prefer Rc4. GM Illescas: Rc4...it is a very computer move. We humans, we try to find the clear plans, more clear ways to play. If you want a teacher, who do you want- Junior 10 or Vishy Anand? You would want Anand to teach you...because of the way Anand thinks, it's easier for you to understand. Computers play very well, but we are not ready to understand how they feel chess. Spot on Miguel! Who needs computers?! If you are interested, Chessbase has analysis of the rest of the game here. After all that said, a special thanks to all those who helped me understand the game of chess. And to Rybka's defense...I feel the same way when I analyze Fisher's games in his My 60 Memorable Games. Who knows! Over the next two weeks, the Kenilworth Chess Club will host another one of its consultation games. The club will be split in half to form two teams which will play as a whole against each other (does that make sense?!). Each team will be led by one of the stronger players to help aid in the discussion about what is going on. Not only do I find these enjoyable, I think they also open the eyes to all the members of the club to see how different we think about the game- from masters to class players. From a brief search of the club sites, I think this may be our fourth consultation game. Here are two of our past consultation games from 2006 and 2007. In his annotations (attached here:NPCC%20Consultation%20Match.doc), Eric mentions that he read about a game played by ten Grand Masters during a training session for the 1952 Olympiad tournament. 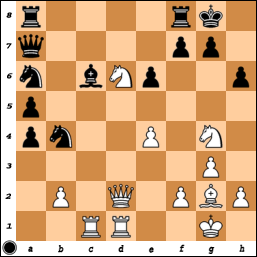 Averbakh, Geller, Petrosian, and Taimanov played White and Keres, Kotov, Tolush, and Boleslavsky played Black. Botvinnik and Smyslov joined the White team after the situation was already difficult. The full score and selected annotations are reprinted in Petrosian's Legacy. If someone from the club has this book, please bring it in- I'd be curious to see that game! GM vs The World here at chessgames.com. This includes Karpov's, Kasparov's, and others game against the world. Consultation games between cities can be found here. 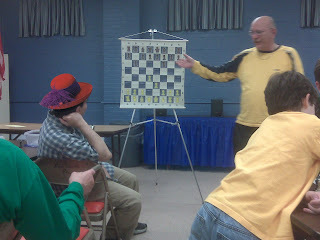 I also wanted to note that someone I met during one of my tournaments years ago belongs to the Burlington Chess Club in Vermont...which just happens to meet the same day and time we do. Perhaps a Kenilworth-Burlington city consultation match is in the near future. Let me know what you guys think. No matter what city you go, you usually can find a place to play chess. In Washington DC, there is Dupont Circle. About a dozen cement chess tables make up a small portion of the circular edge of the park. Most are used for chess, but I saw some poker games going on too. I decided to play a few games to warm up for the Kenilworth Blitz tournament this Thursday. It was nice because more casual players were there than the gambling type - meaning I didn't loose that much money! But in the end, nothing beats NYC's Washington Square Park. 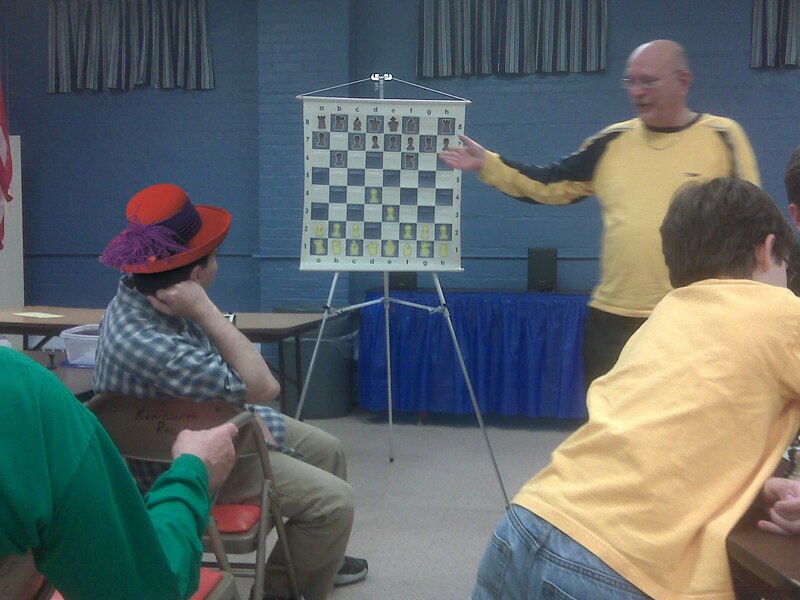 This Thursday, April 8th, there will be a blitz tournament at the Kenilworth Chess Club. It will not be USCF rated. 1st round will start around 8:35. 100% of entrance fees will be in split among prizes. I would like to do a 7 round swiss, but everything will depend on the number of players that enter. We may end up doing a round robin. 100% of entrance fees will be given back out to the players and I will make sure that there is at least one U1700 or U1600 prize. Also a reminder that IM Esserman's lecture is coming up next week on the 15th. Make sure your taxes are done folks. On this beautiful day, I was expecting to see some more chess players finding spots to play at the park- but no luck. The construction scene where the tables once were is still a mess. On the brighter side...with a stroll by the Village Chess Shop, I discovered some of the old WSP cement chess tables set up outside their place. I'm glad they were snatched up and put to good use. Update: From the sign in front of the construction site (NYC's Park and Recreation Department)..."The chess plaza is being restored with new game tables." Scheduled completion is Fall 2010. Wiki has a good summary of the park's renovation. I also want to note chess players now play on the North West side of the park. Along with some scrabble and bridge players! One of the more recent additions to the club is the Kenilworth Chess Club Library. It has been growing with some respectable additions over the last couple months- thanks to everyone who has been donating their books. Thanks everyone! The library is open to active KCC members. 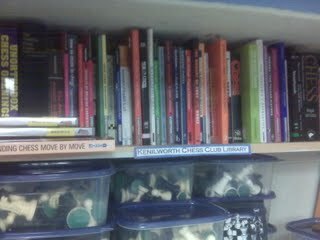 Please try to keep the books circulating by not keeping them for extended periods of time! Sign out sheet is in the cabinet. Just some of the titles in completely random order will be posted in the comments. I also want to add that we have a "donated by" sticker that you can slap in the book. Full house tonight with all three Kenilworth Garden State League teams playing.